This is a picture of my Gran and Grandad having a drink or few at the Worlds End Pub. I am not sure when but suspect it is in the 50’s. From left to right: ? , ? , Uncle Albert Locke, Uncle Jack Smith, Aunt Dots Locke, Grandad Edward Locke, Gran Flo Locke, ?. The gentleman far left is “Ralphie”, I can’t remember his last name, and the gentleman next to him is Ernie Gibbins. John, Nice to hear from you. This is a copy of a picture that was loaned to me by Ivor. If you have any others I would be pleased to receive copies, say by e-mail if possible. I will also look through mine to see if there are any of mutual interest. I used to keep in touch with Dear Jean and I hope all your family are ok. Please pass on my good wishes when you next see them. Hope you are well. 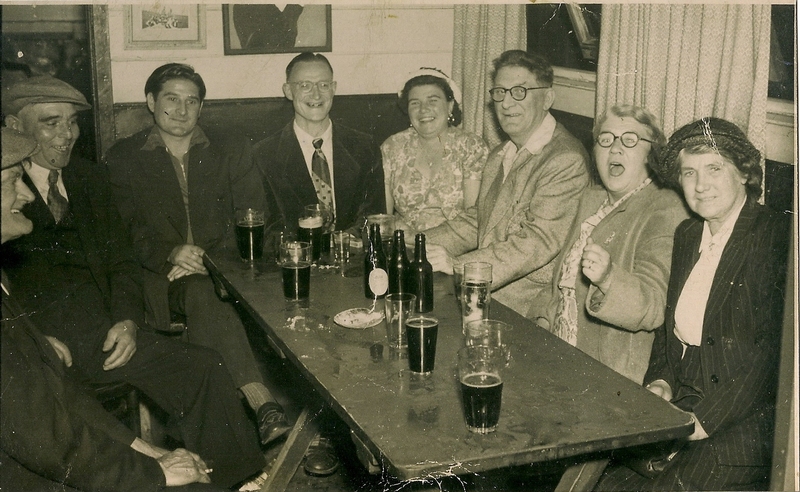 hello barry, i too have this photo of family at the worlds end pub. i think you are right and say it was taken in the 1950s, as i can remember it appearing in the household at that time. i always wondered who the other three people are, i also have some pictures of your family if you would like them, when they got married etc. from cousin john.